VIZ Media Announces "Requiem of the Rose King"
Requiem of the Rose King is loosely based on William Shakespeare's plays, Henry IV (1591) and Richard III (1592), and this manga is set in medieval England. The House of Lancaster (represented by a red rose) and the House of York (represented by a white rose) both covet the throne of England. Their struggle is called the “War of the Roses.” Into the house of Richard of York is born a third son, a sickly child that he names “Richard” after himself. Richard dreams of his family ascending to the throne, a throne that will one day be his. As Requiem of the Rose King, Vol. 8 (Chapters 31 to 35) opens, the House of York reigns over England. Now, this ruling family will turn on itself. King Edward has heirs, so he has lost interest in his wife, and he has turned his attention to the seductress and self-proclaimed witch, Jane. Meanwhile, Edward's brother, George, chafes under the rule of his brother, but is he willing to plot treason against his brother? What is the other brother, Richard, doing? He is determined to protect the House of York, and he is willing to kill anyone, anywhere, and anytime to do so. THE LOWDOWN: The Requiem of the Rose King is one of my favorite manga, and I think that it will be for the duration for its run. I love it truly. Requiem of the Rose King Graphic Novel Volume 8 takes a sudden turn towards what we knew was going to happen. The members of the House of York were plotting against one another even when they were most vulnerable to the members of the House of Lancaster. 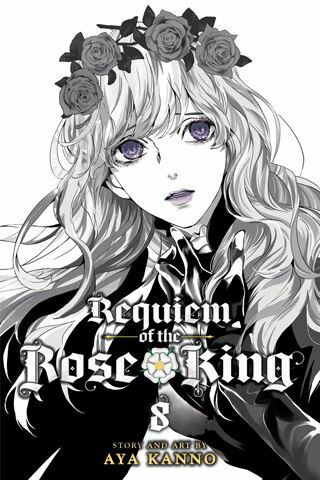 The only question is how will Requiem of the Rose King creator, Aya Kanno, execute the story from this point. I think that she has been killing it (as the young folks say) so far, and I expect this narrative to get even more delectable. Come share this reading delight. I READS YOU RECOMMENDS: Fans of Aya Kanno and of historical dramas will want to try Requiem of the Rose King.